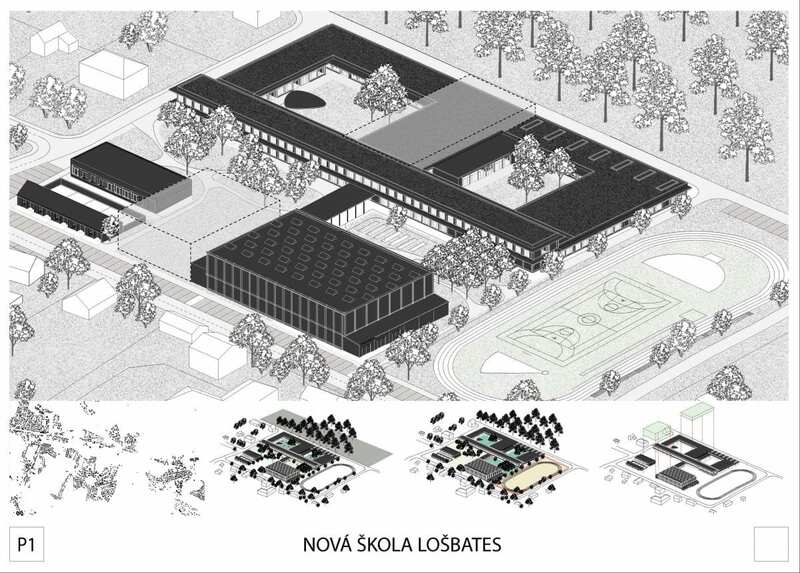 Sponsored by LOŠBATES, an administrative entity established by four adjacent municipalities on the outskirts of Prague, this competition for a primary and secondary school, won by the Canadian firm, Pelletier de Fontenay with Valerio Sartori from Switzerland, drew 108 entries from 38 countries. 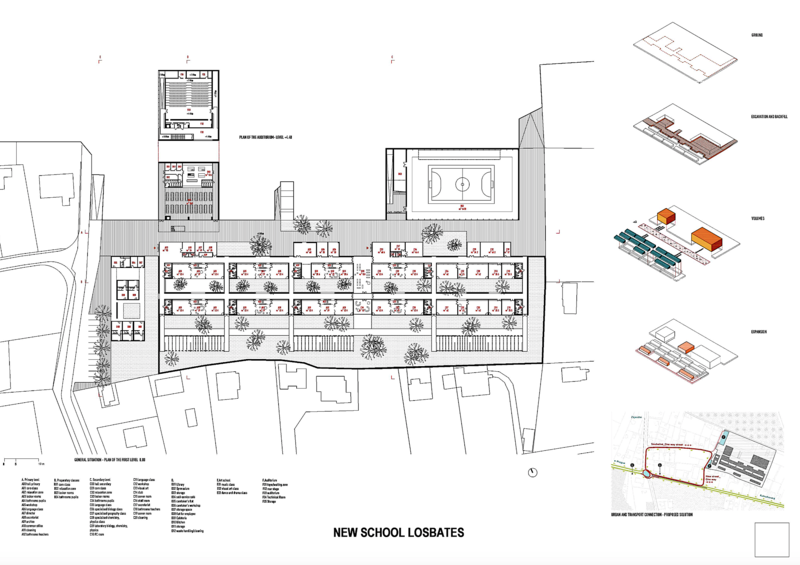 The project brief asked for a school of more than 400 students, as well as many shared facilities for the residents of the surrounding communities—an important response to the clear lack of collective facilities in those communities. 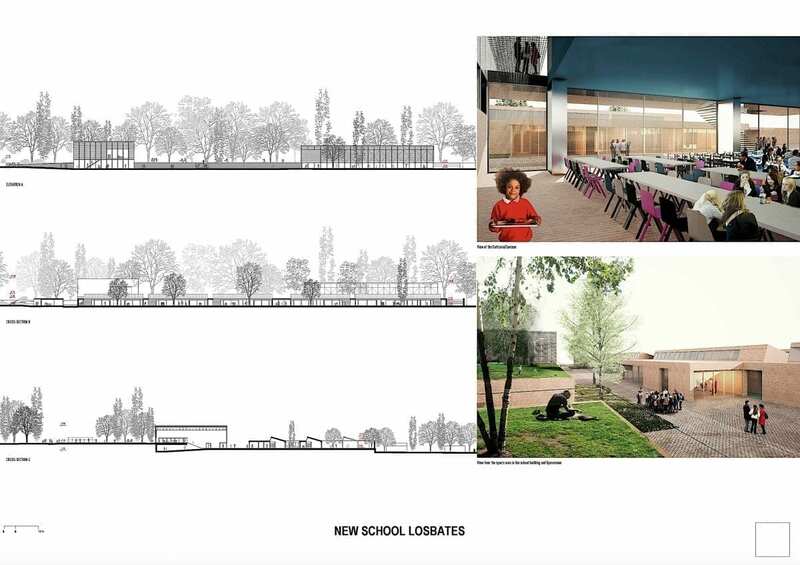 The stated intention was that the school’s gymnasium, sports complex, auditorium, multi-functional hall and art school, will all be shared by students and the area’s residents, creating a new civic hub for the community. 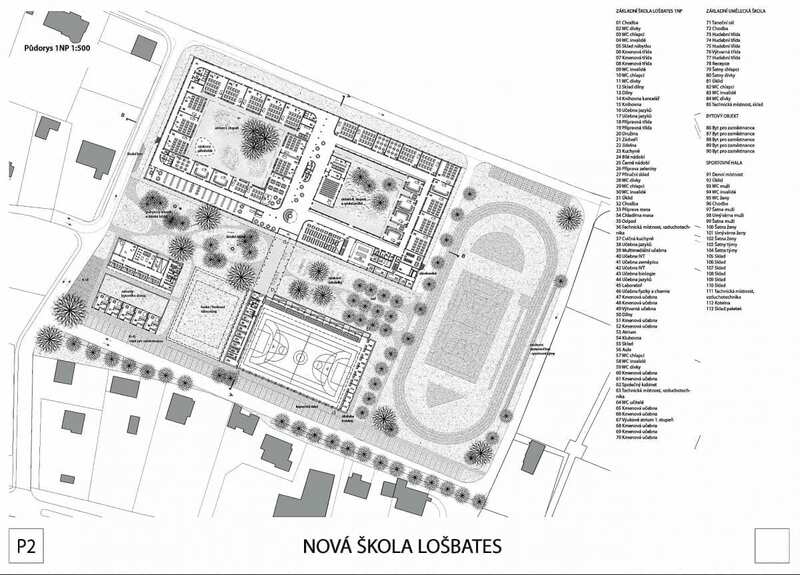 According to the winner’s narrative, “the project aims to create a new heart and symbol for the communities of LOŠBATES. 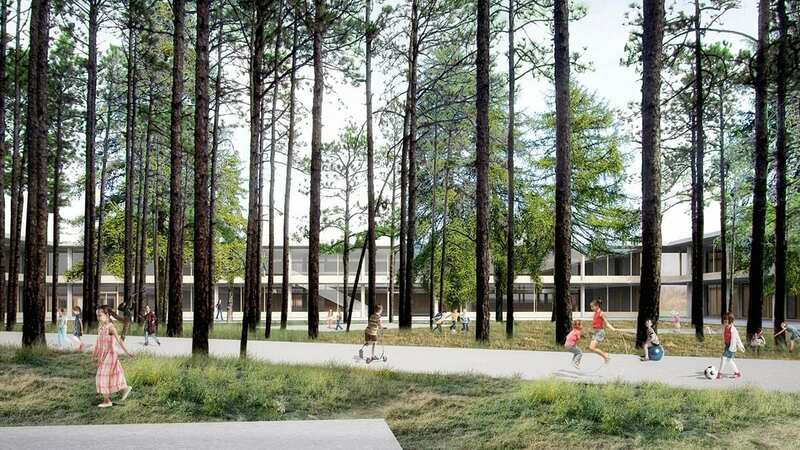 The school is conceived as an open cloister, an articulated ring connecting four separate program clusters into one coherent form surrounding a small forest. 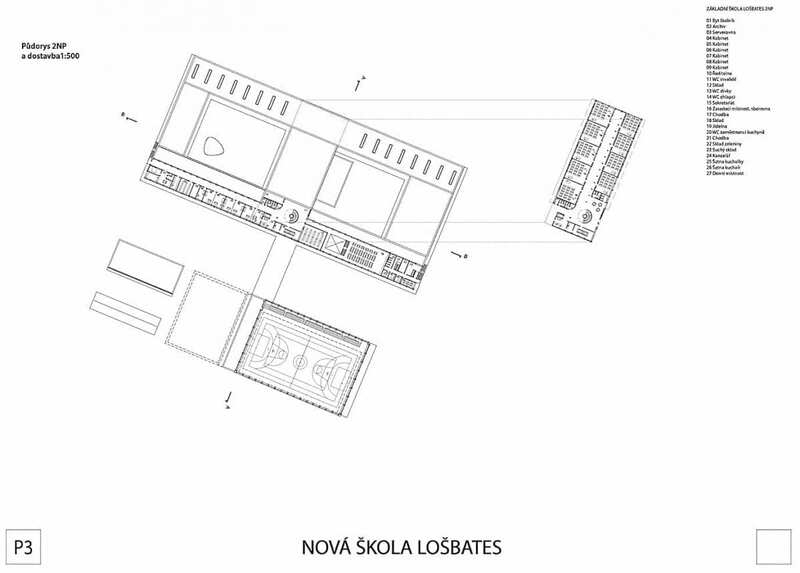 This cloister is flexible both visually and functionally. 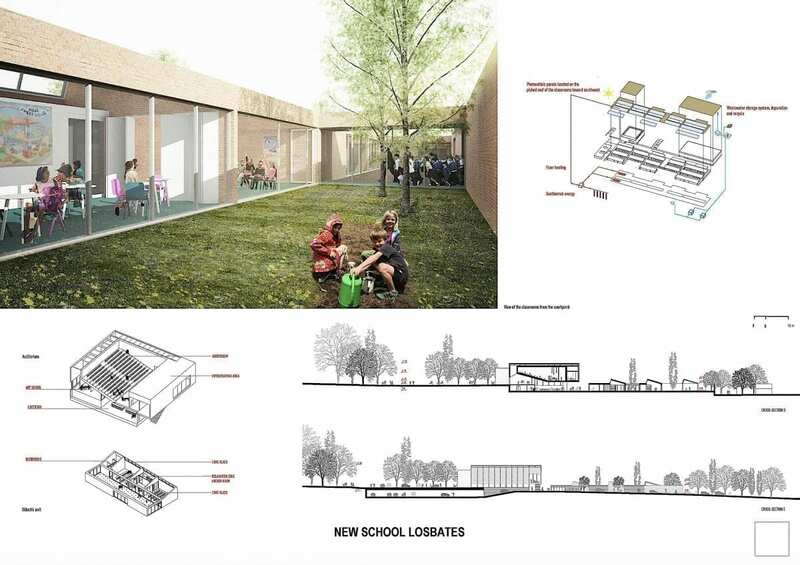 It serves as an entrance, a corridor, a covered outdoor area, a gathering space, an informal classroom and much more. 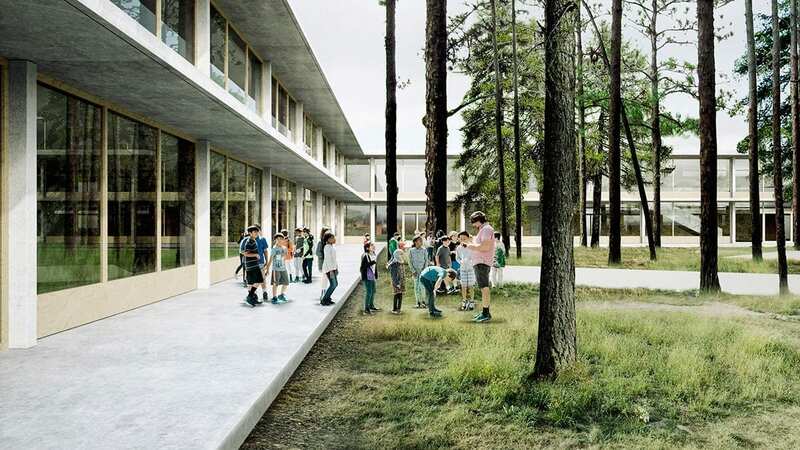 Unlike the traditional cloister, it’s open ended and permeable. 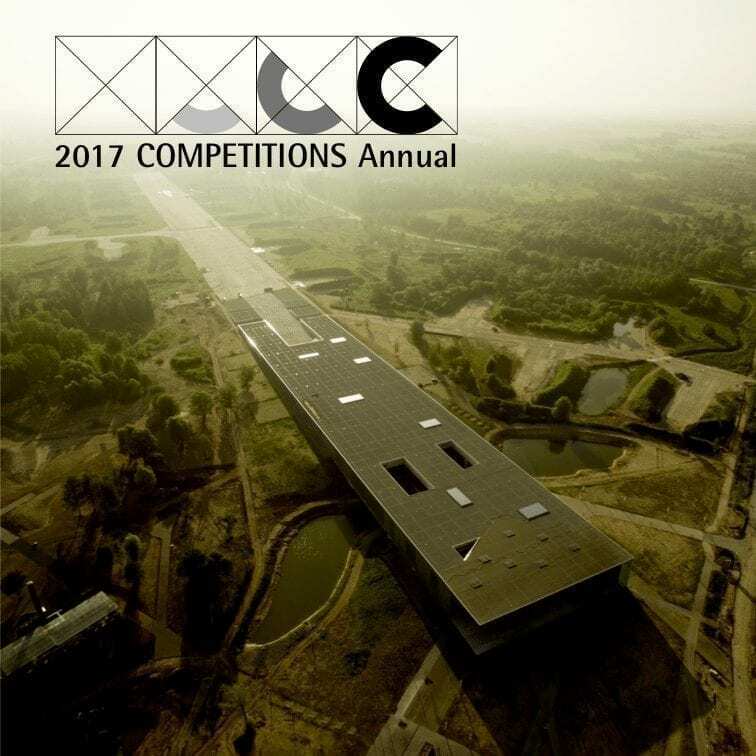 Based on the jury’s choices for the two top-ranked winners, one has to assume that the presence of the interior courtyard as a symbolic extension of the exterior landscape did not go unnoticed. 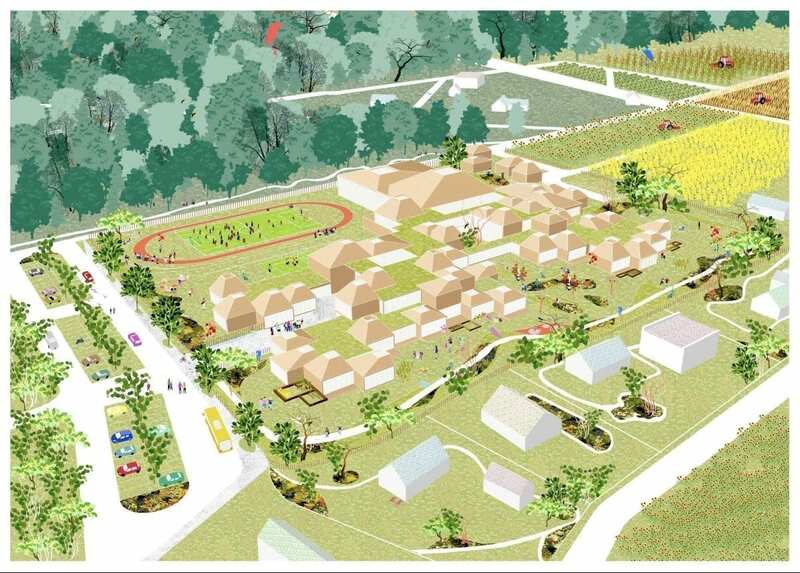 There were a number of entries that occupied the entire site with the different functions, sometimes separated from each other, and almost providing a village-like atmosphere, as epitomized by the honorable mention entry from Poland. 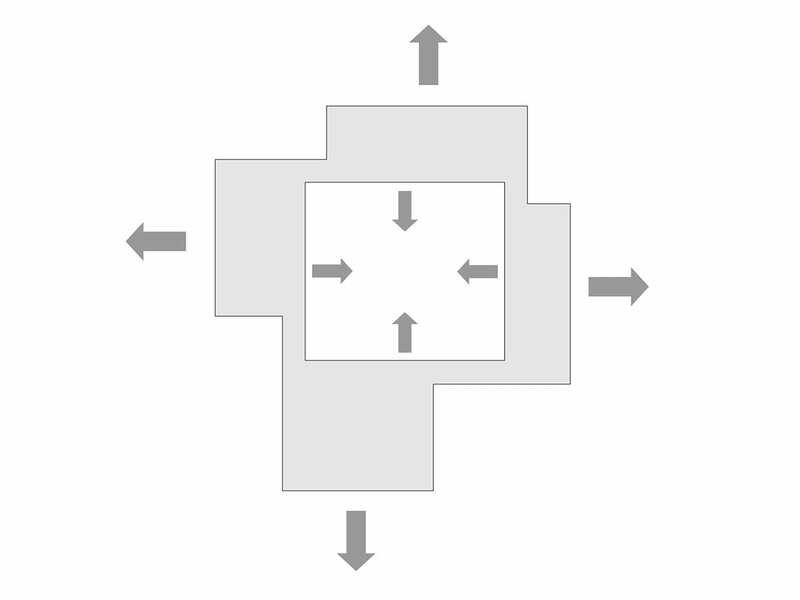 But the logical connectivity exhibited by the winner, integrating the functions in such a manner as to maintain circulation without disruption, surely was a determining factor in the adjudication process. 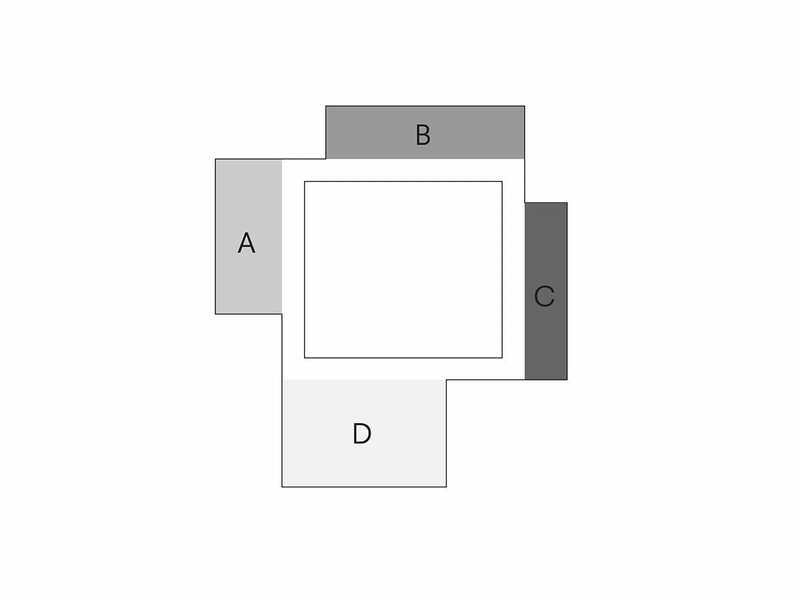 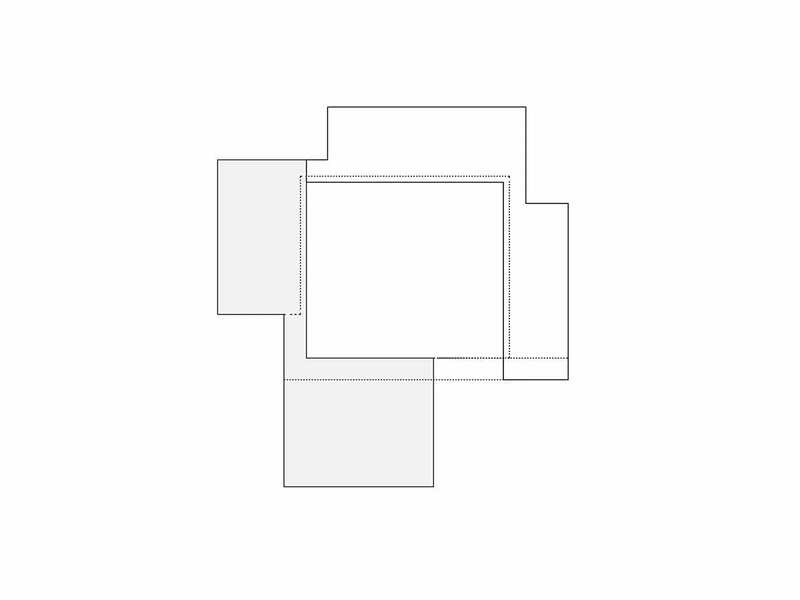 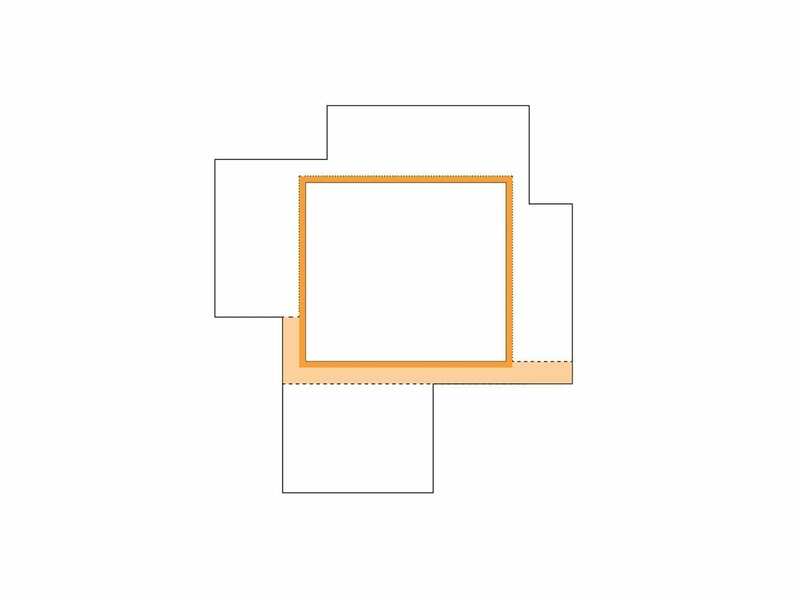 How to add space for an addition was also an important issue for the jury; but the winner’s stacking solution did not dissuade them from honoring the Montreal firm’s general concept. 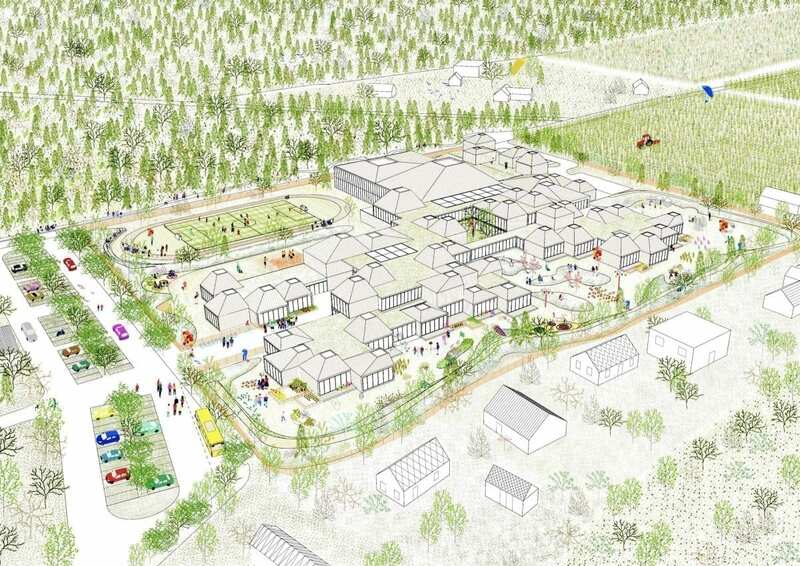 The eight-person jury consisted mainly of Czech architects, with only one exception, Dorte Kristensen of the Netherlands, who teaches at the Delft School of Architecture and has been with the firm Atelier PRO based in The Haag. 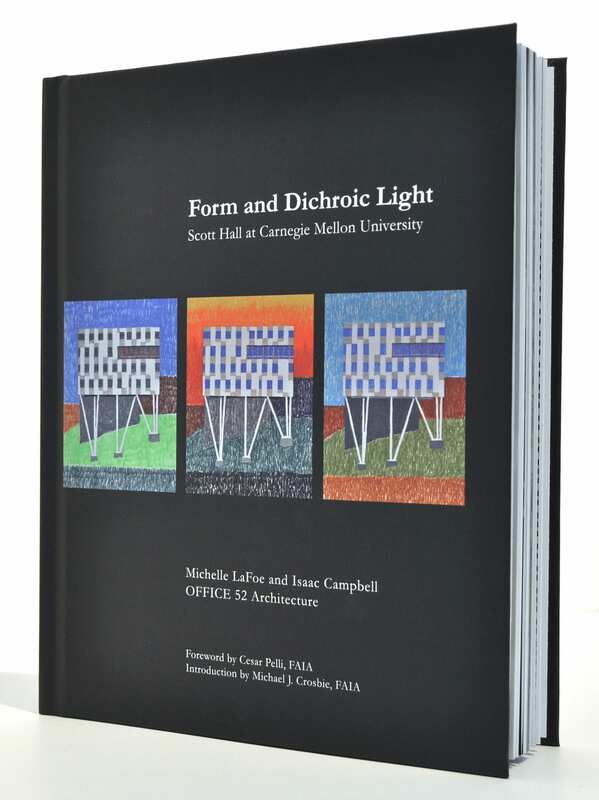 The authors have met the requirements of the assignment to the fullest extent and fulfilled the expectations of the announcer. 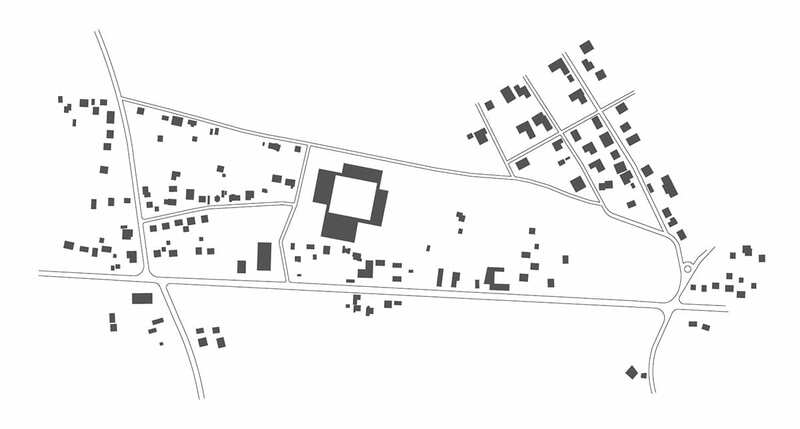 The architectural expression is appropriate to the new institution, which forms a stable background for four municipalities. 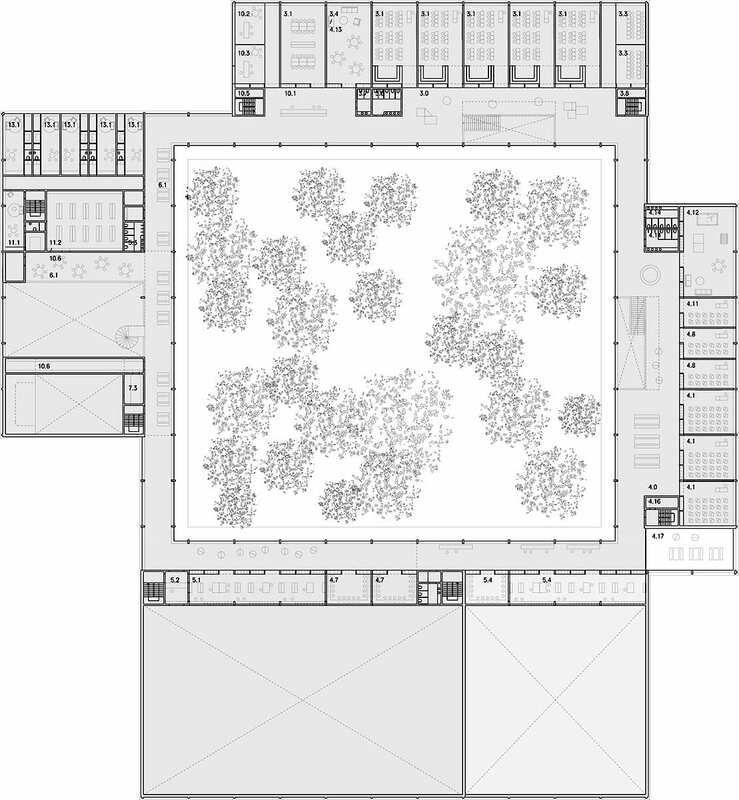 The jury appreciates the symbolism of the separate objects connected by the cloister corridor around the courtyard, thanks to which the smaller masses of urbanistically divided volume of the whole building works as one whole. 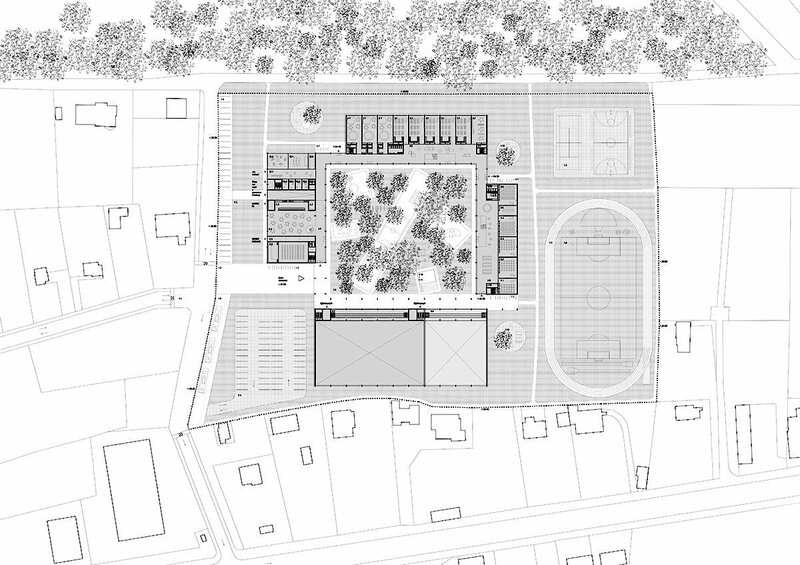 Involvement of large volumes of gyms in the area is sensitive. 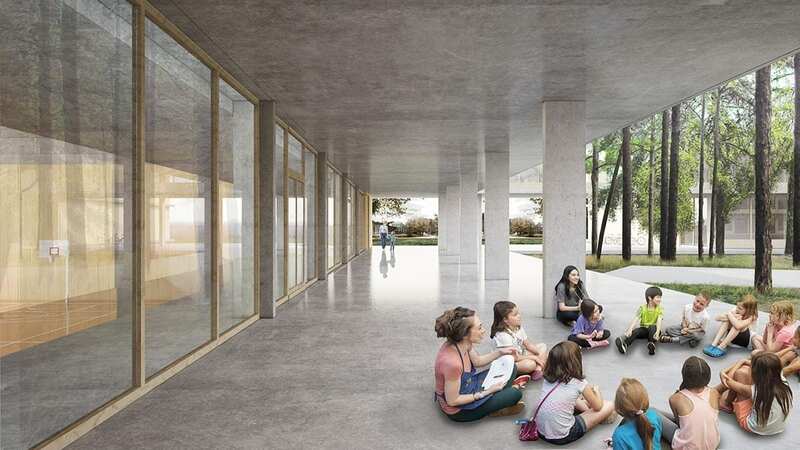 The volume of the underground building (in particular parking and communication) can be optimized, without significant influence on the layout and the school’s operation. 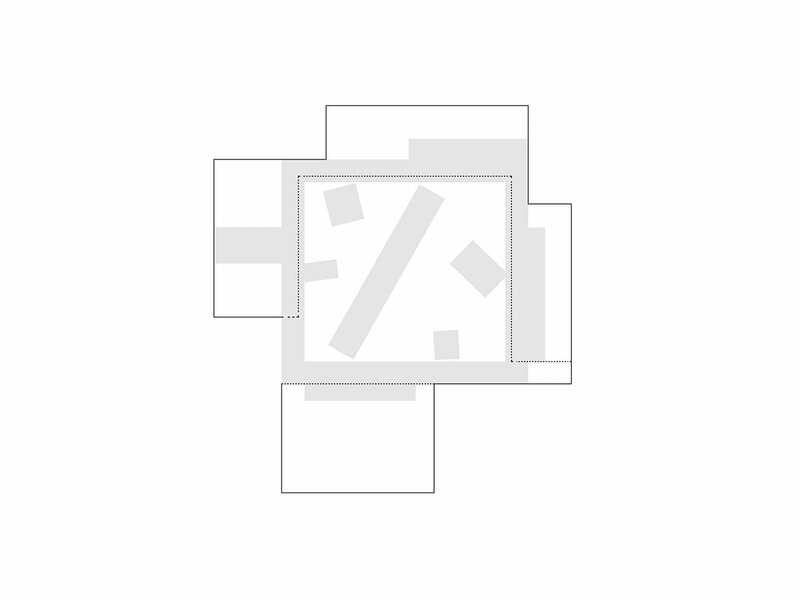 The south and west façades of an object, oriented to individual apartment buildings, hold a maximum height of two floors. 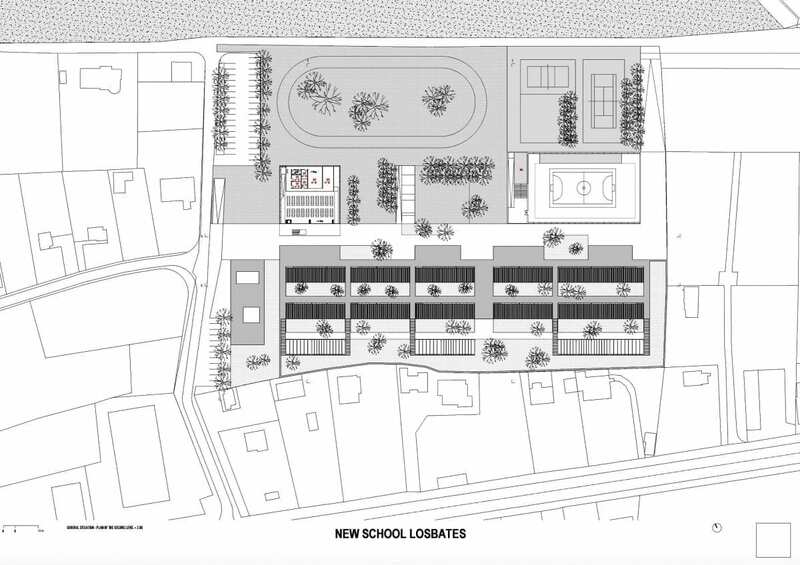 The planned extension raises above that level; however, it is oriented north to the forest and to the east towards the sports complex, so it will not negatively affect the existing area. 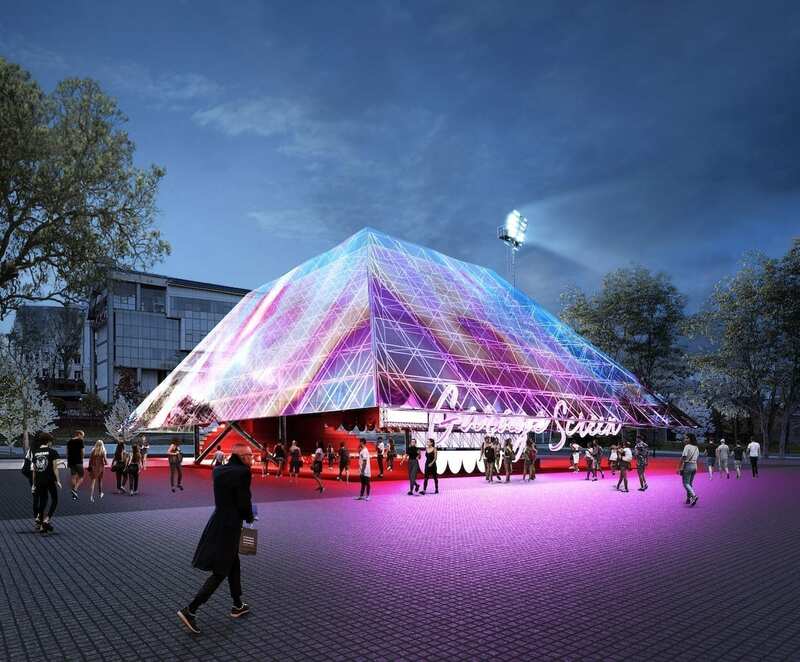 The proposal has largely met the competition requirements and expectations of the announcer. 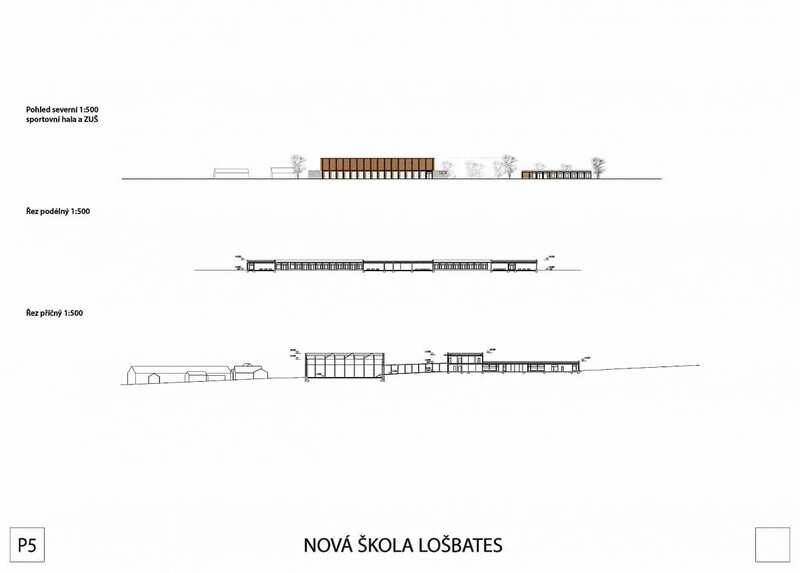 The authors have very well worked out the layout of the school’s operation: it is sufficient enough, at the same time economical, logical and functional. 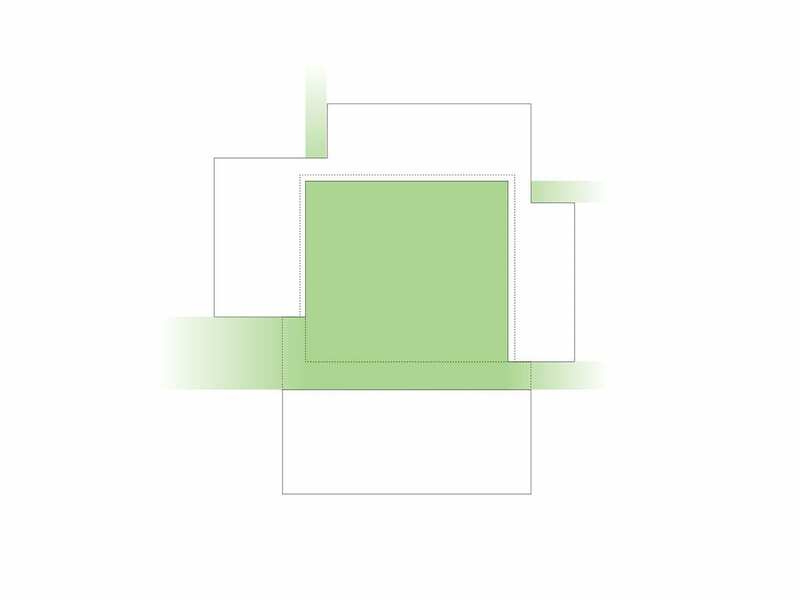 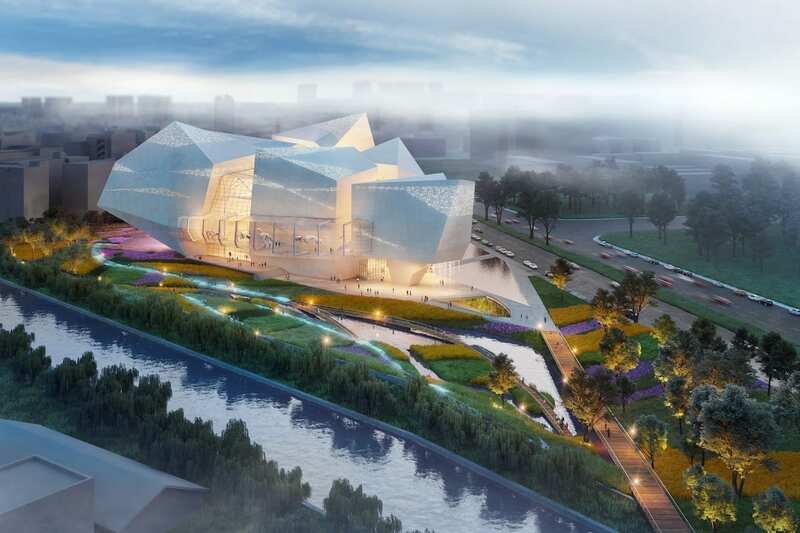 The project brings a balanced and moderate architectural expression. 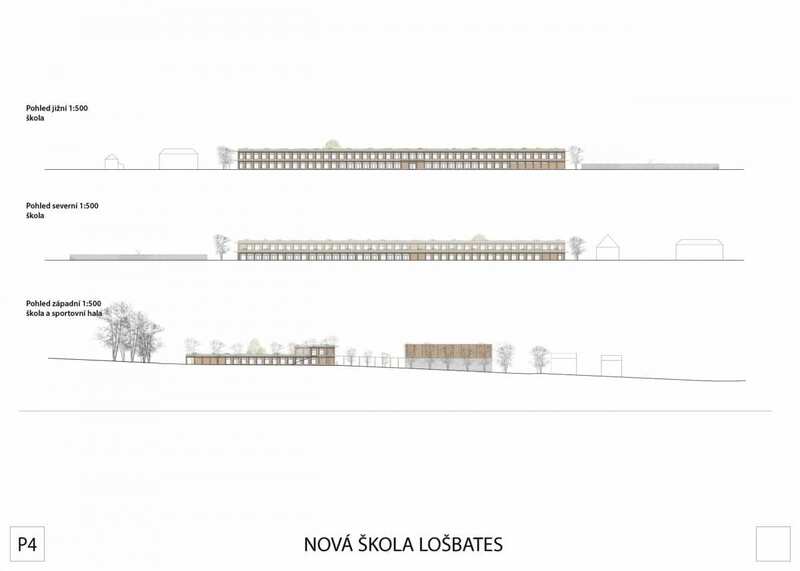 The discernable scale of the linear effects of the north and south façades is apparently influenced by the support of the breakdown into the first and the second level. 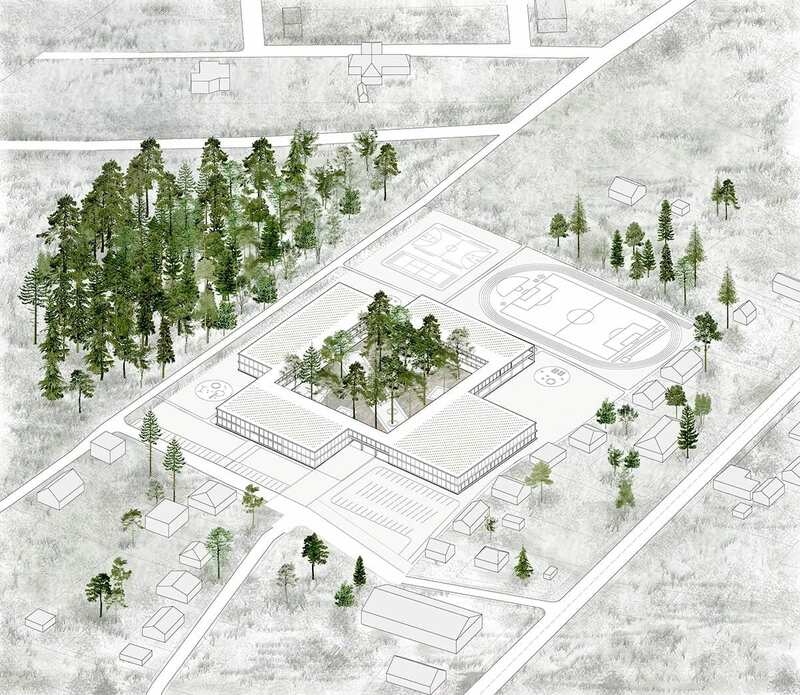 The design responds well and follows the adjacent forest and attractive natural surroundings. 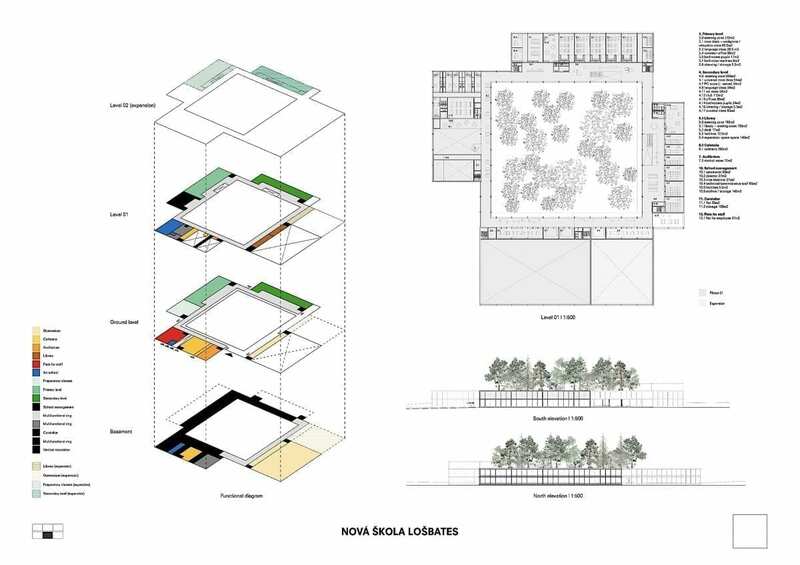 The jury recommends further consideration of the situation of the linear parking spaces at the southern edge of the premises. 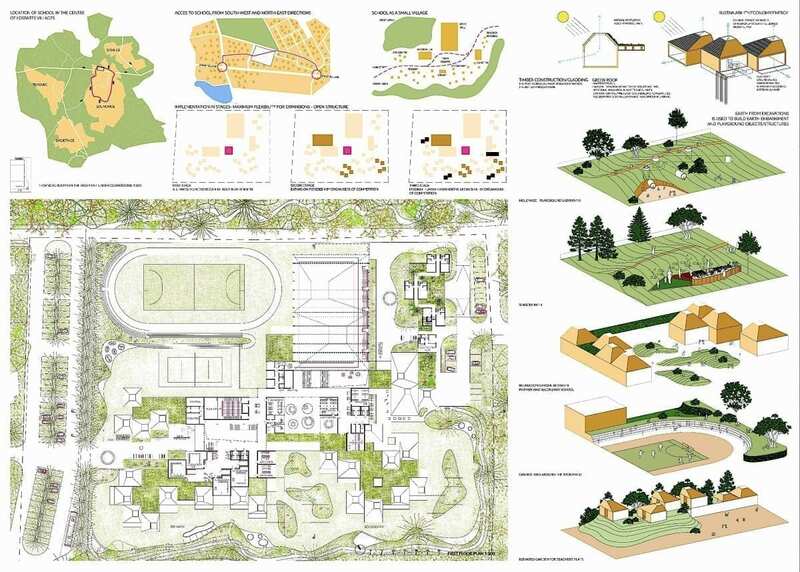 The proposal has largely met the requirements of the competition and the announcer. 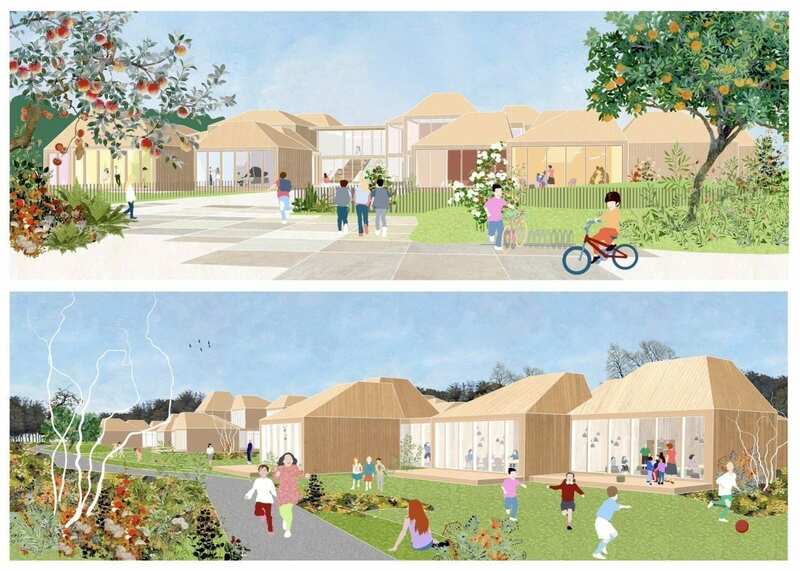 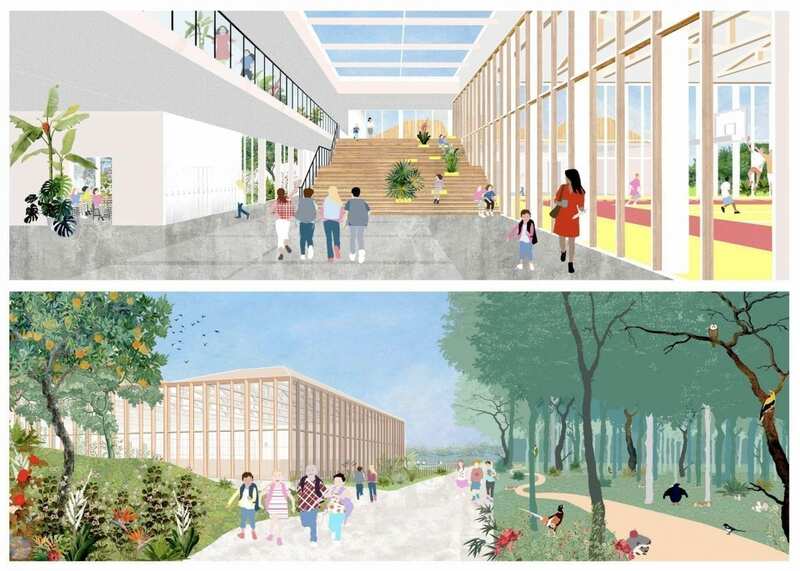 The jury appreciates the readable and functional urban layout of the playground and greenery at the forest, the common middle service and community zone and the southern compact single-storey building with courtyards designed for teaching. 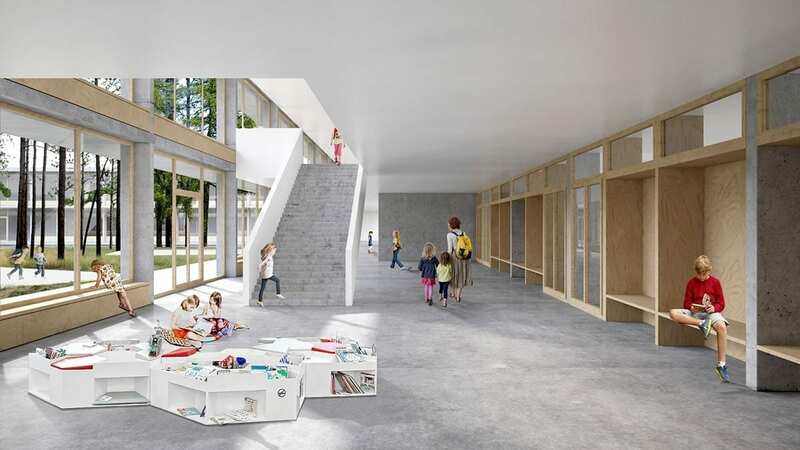 The intimate atmosphere of the learning spaces is favorable, which at the same time brings enough variability for the use of nowadays teaching trends. 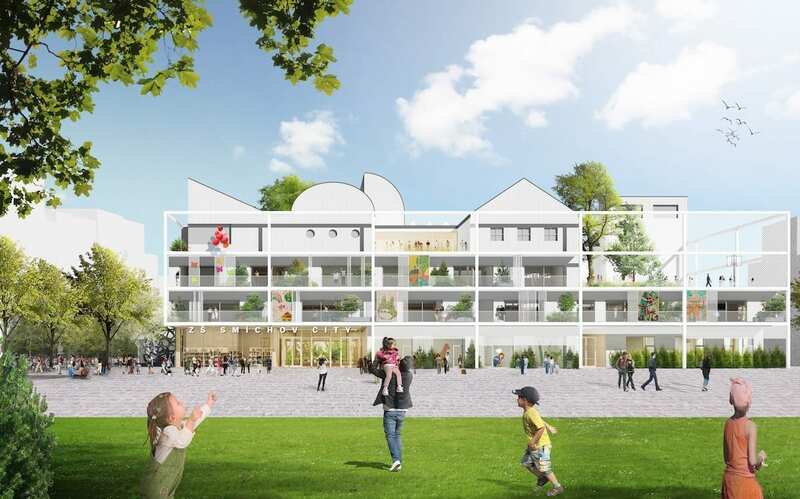 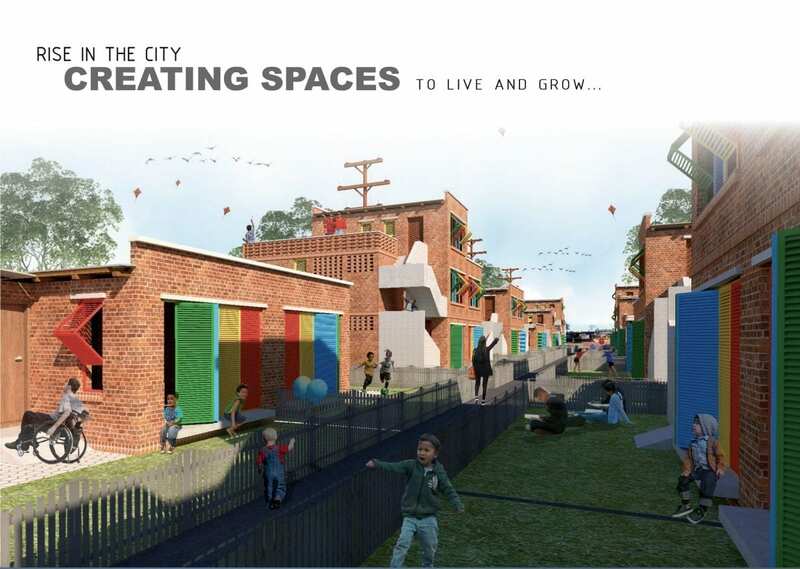 The concept of a residential “street” inside the complex provides a new living public space to the village, and at the same time it is a successful urban response to the local context. 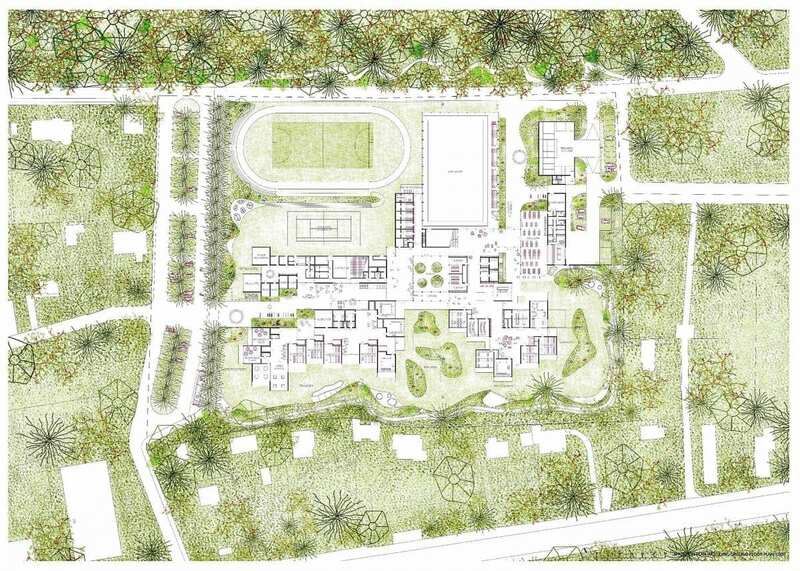 A clear and welcoming concept of a campus, which, in spite of its fragmentation in local climatic conditions, will bring a number of questions; in particular a generally less favorable ratio of floor areas and building envelope. 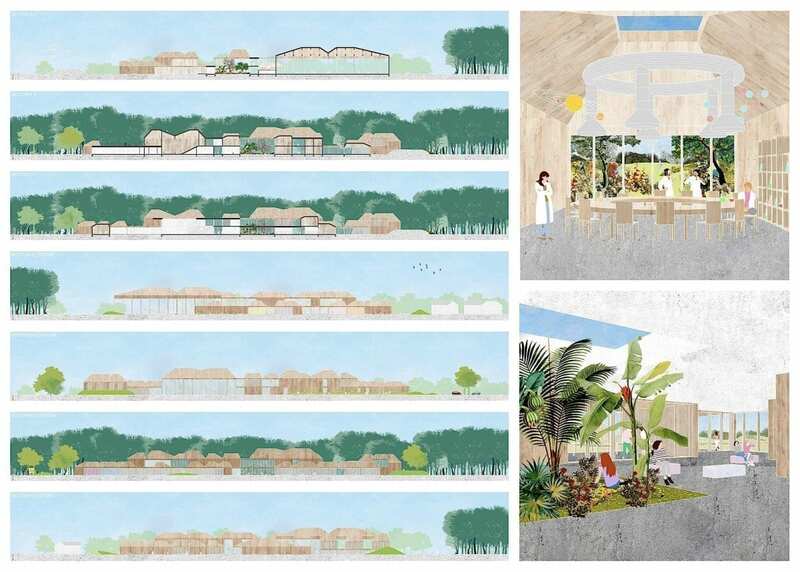 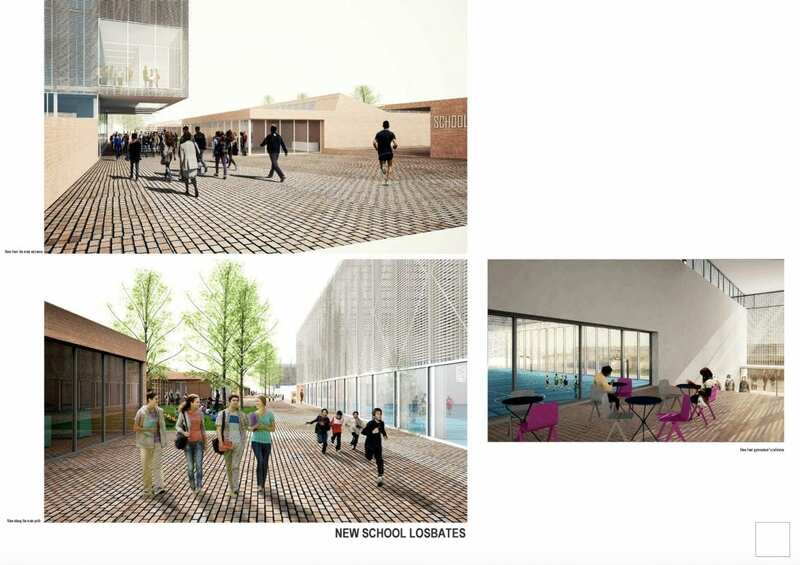 The jury recommends further consideration of the more difficult connection of the gym, the hall and the canteen with the classroom complex, and draws attention to the lower adaptability of the concept in the event of a larger intervention in the number and size of the learning spaces. 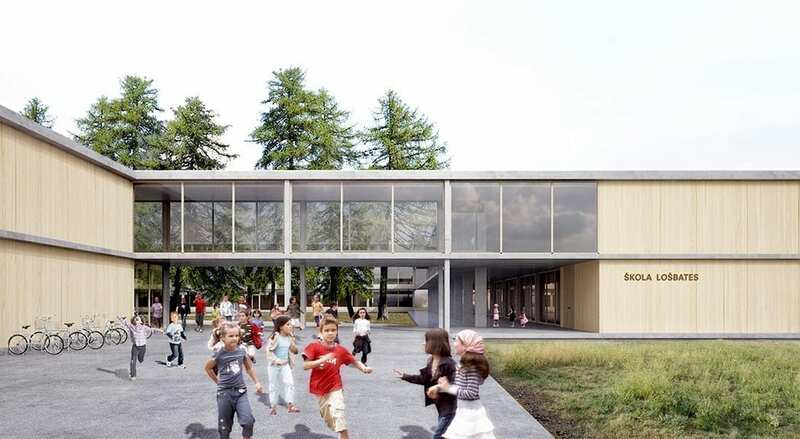 The jury awarded the proposal an honourable mention because it is attractive by its exceptional spatial conception and cluster work with the school’s internal program. 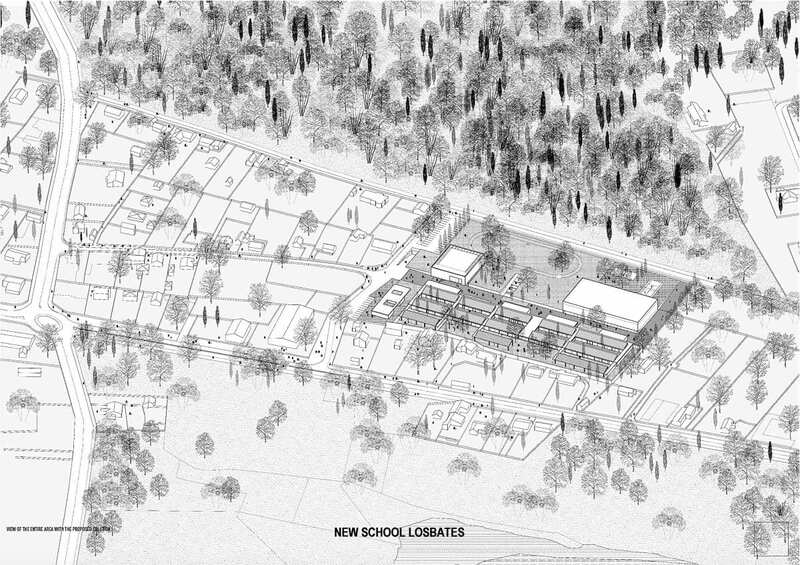 Although it acts like a pavilion scheme, it is actually a very compact, thoughtful and scale-appropriate proposal. 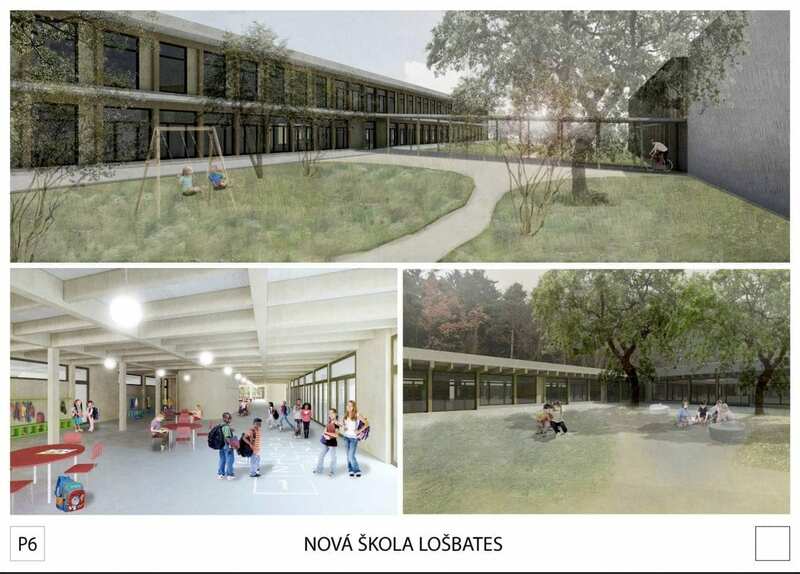 However, due to the construction and maintenance requirements, the jury could not recommend it for implementation.